Whenever a bear is spotted in South America, the viewer knows that it is a Spectacled Bear. The bears face is marked with white around its eyes that give it a spectacled look. And if the viewer never sees the bears face to identify it? Since it’s the only species living in South America, they’ll still know that it’s the Spectacled Bear. It would be rare to see one of the furry creatures. Researchers estimate that there are only 18,000 living Spectacled Bears. The Spectacled Bear is most often found in the deep forests of Venezuela, Columbia, Ecuador, Peru , and Brazil, but may also inhabit other areas including rainforests, steppe lands, and deserts. The may also live in cloud forests or high altitudes. Wherever they live, there will be fruit available for feeding. Spectacled Bears may be any color ranging from black to brown or a reddish tint. The adult bear is estimated to be 150 to 180 cm and weigh 100 to 155 kg. The male is often larger and heavier than the female bear. Standing on all fours he’ll stand about 76 cm tall at the shoulder. Variety is the spice of life when it involves the Spectacled Bear’s diet. It will eat anything from vegetation, small animals including mice, rabbits and birds, orchid bulbs, leaves, and fruit. The fruit is by far its favorite food. When the bear discovers a good supply, he’ll “set up camp” and hang out for several days to feast on the tasty treats. When the female reaches four to seven years she’ll be ready to mate and bear cubs. The mating season occurs in April, May and June. After spending several weeks with her male counterpart she’ll deliver two (sometimes three) cubs somewhere between November and February. These furry little bears will weigh only 10 or 11 ounces at birth. 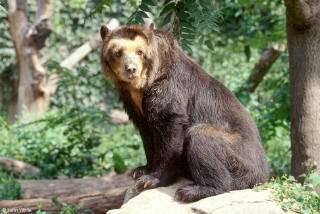 Unlike most bears, the Spectacled Bear is nocturnal. He will eat and do his traveling at night. When dawn arrives he will climb a tree to a “nest” or platform that he has constructed for sleeping in. Many bears climb trees, but most prefer to sleep in caves, overturned trees and dens. Researches have trouble learning about the Spectacled Bear because of its remote homes and shyness. E-mail to add your Spectacled Bear related website.